Climate and economy are being linked. Climate is a multiple loop, multiple input, complex system. The facts and the hypotheses do not support CO2 as a serious ‘pollutant’. In fact it is plant fertilizer and seriously important to all life on the planet. It is the red herring used by the left to unwind our economy. That makes the science relevant. ater vapour (0.4% overall by volume in air, but 1 – 4 % near the surface) is the most effective green house gas followed by methane (0.0001745%). The third ranking greenhouse gas is CO2 (0.0383%), and it does not correlate well with global warming or cooling either; in fact, CO2 in the atmosphere trails warming which is clear natural evidence for its well-studied inverse solubility in water: CO2 dissolves in cold water and bubbles out of warm water. The equilibrium in seawater is very high; making seawater a great ‘sink’; CO2 is 34 times more soluble in water than air is soluble in water. The ultimate cause of the solar magnetic cycle may be cyclicity in the Sun-Jupiter centre of gravity. We await more on that. 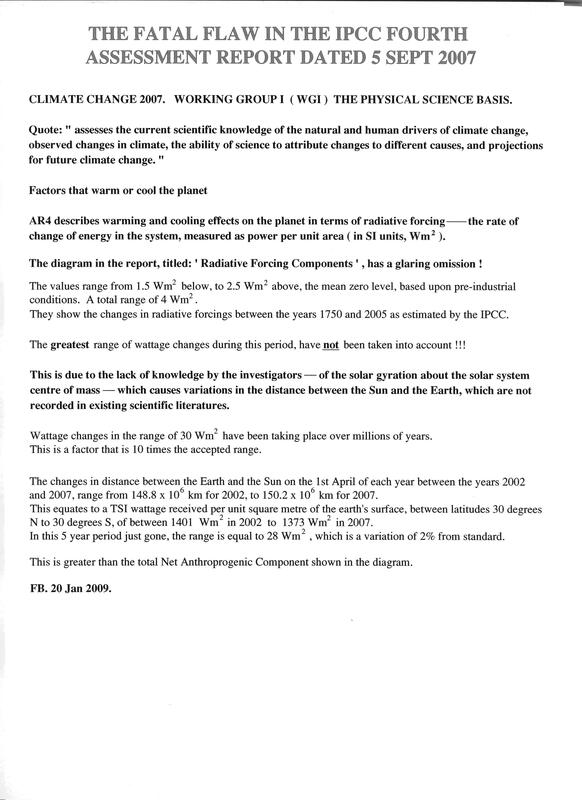 Although the post 60s warming period appears to be is over, it has allowed the principal green house gas, water vapour, to kick in with more humidity, clouds, rain and snow depending on where you live to provide the negative feedback that scientists use to explain the existence of complex life on Earth for 550 million years. Ancient sedimentary rocks and paleontological evidence indicate the planet has had abundant liquid water over the entire span. The planet heats and cools naturally and our gasses are the thermostat.